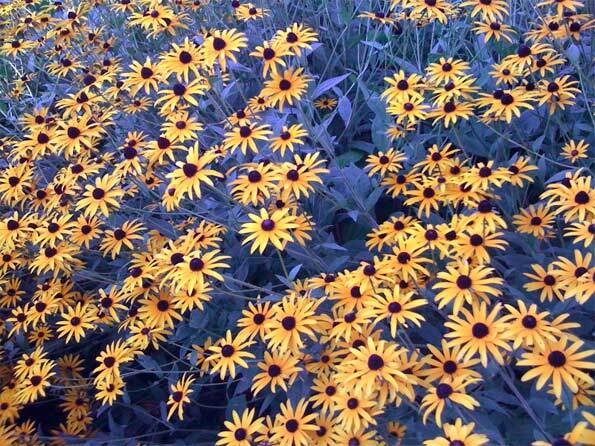 Black-eyed Susan flowers in full bloom in early September in Chicago. Black-eyed Susan (Rudbeckia hirta) is an upright annual (sometimes biennial or perennial) native to most of North America, and is one of a number of plants with the common name Black-eyed Susan with flowers having dark purplish brown centers. Other common names include Blackiehead, Brown Betty, Brown Daisy, Brown-eyed Susan, Gloriosa Daisy, Golden Jerusalem, Poorland Daisy, Yellow Daisy, Yellow Ox-eye Daisy. The genus name honors Olaus Rudbeck, who was a professor of botany at the University of Uppsala in Sweden and was one of Linnaeus’ teachers. The species name refers to the trichomes (hairs) occurring on leaves and stems. What are those pretty yellow flowers with black centers? What are those pretty yellow flowers with dark purple centers in late summer?